2 OF 9While this client got one that is directly above her first piercing. "There's no right or wrong way to do it," Thompson explains. "It's a great way to turn a negative into a positive." 3 OF 9Thompson does, however, play favorites with jewelry. "I love this done with gemstones, especially diamonds," Thompson says. Piercing with studs also allows for faster and better healing than hoops since it's a straight post and not a curved bar. 4 OF 9Of course, the look has become so popular that many clients come in wanting the stacked look even without an existing hole. Thompson notes that healing time and pain doesn't change too much when doing two, but it is slightly different. "You will have a little more swelling so it will take a little longer to heal and be a little more painful, but it's negligible," he says. 6 OF 9Then move to something new in a few months. "A hoop looks rad in the bottom hole," he says. 7 OF 9But perhaps the best thing about this piercing is being able to use the top hole for heavier earrings that aren't supported by a low piercing. Once healed, you can leave the bottom hole empty and pop a statement earring into the top one for a night out. 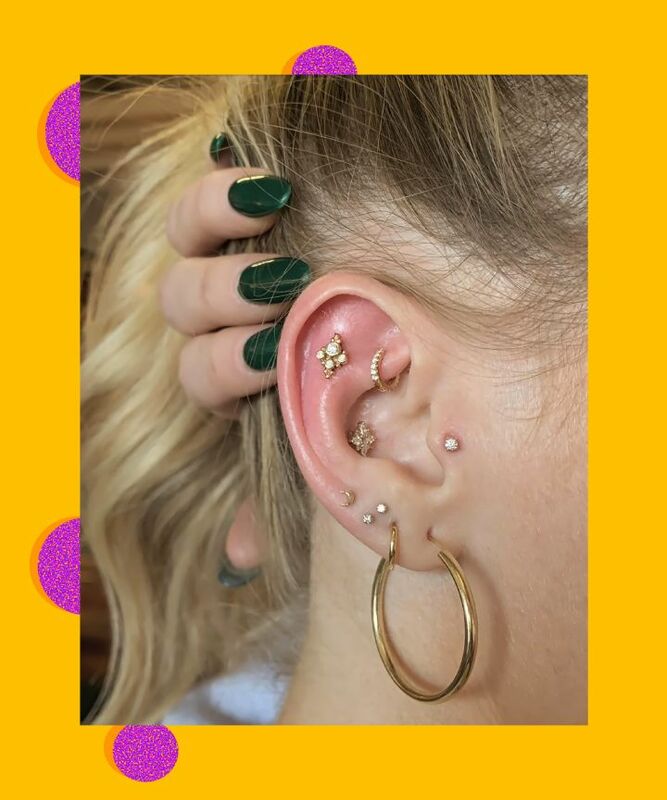 8 OF 9And if you ever get sick of the vertical look, you can easily add a third hole and create a pyramid or constellation piercing like this client did.